Some people still think when I mention parachute games that it refers to jumping out of an airplane and doing tricks in the air while descending to the earth. It does not (that’s sky diving). Most people nowadays know that playing parachute games means doing different games with a parachute ON THE GROUND. 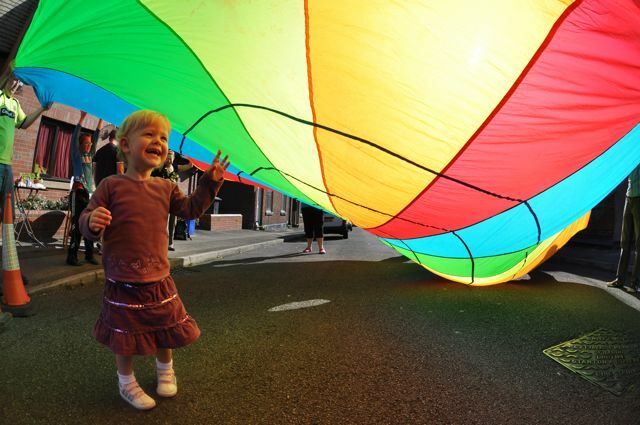 Besides being attractive – a play parachute creates a spectacle of color and movement – and fun, there are many excellent reasons for introducing and participating in parachute play. A large parachute, 24 -26 feet, can involve a group about the size of school class. Smaller parachutes can work with smaller groups but it’s hard to fit groups of 25 or over on smaller ‘chutes. Larger parachutes of 28 to 30 feet are difficult to do the games with because it’s hard to lift them off the ground, even with a large group. Because of the nature of the parachute, everyone is facing each other for most games. This creates a sense of togetherness – because we are all in this together. 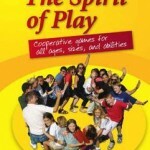 We learn cooperation because everyone must cooperate to make the games go well. If we all pull together, the games work quite well, which makes everyone happy. In this sense, parachute games great for team building. This also means it is immediately fairly obvious if someone is doing something to disrupt a game. The leader can then ask the person to join us playing together to make the game go well. It’s really fun to have the game go well, and players recognize this. If the player persists in disruption, there may be a more serious issue for that person and may need someone to take him or her aside to see what is really going on. For that reason, it is always best to have more than one adult or leader for parachute games. Although we don’t do the games primarily for skills, we do them because they’re fun, other skills that are naturally involved are trust, problem solving, verbal contact, tactile contact, and adaptability, Personal behavior included are self control, creativity, spontaneity, and even a little pantomime. Perceptual and physical skills that are part of the games are visual ability, skillfulness and coordination, reaction, strength, and endurance. Many basic motor skills are enhanced while participating in parachute play. 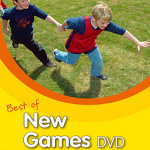 Walking, running (Flying Parachute, Jellyfish Jaunt), jumping, lifting (Mushroom and many other games), and crawling (Cat & Mice, Wave Rolling), come to mind that are part of quite a number of games. There is usually a fair amount of movement associated with most parachute games. However, while being aware that these skills are involved and participants can learn them by playing parachute games, the thing I must come back to is that first and foremost: never lose sight that they are mainly to have fun! Fun and interactive way to learn tips and skills to lead games in groups. It has given me new ideas, enthusiasm and skills to take New Games further.